So Just What Is This Porphyria? Give Me Some Information !!! Where did it get it's name? The Greeks have a word "porphyrus" which means the color purple. The term "porphyria" and "porphyrin" are derived from this Greek word. The urine of some patients, but not all, may present a reddish/purple coloring. Some researchers refer to it as port wine. At one point in porphyria history researchers wanted to call the disease "pyrrolia". The reason for this was due to the fact that the prominent metabolites are pyrroles. However the name never came to be used. Who first diagnosed the disease? When? Who were the leading first physicians/scientists? As long as there has been human life, there has been porphyria. Porphyria began at the beginning of time and has continued to mutate throughout ensuing generations. The name "porphyria" is only rather recent. For centuries it was known as blood/liver disease.At one time the abdominal pain was actually thought to be from the liver. In some cases it was because of victims dying from liver failure or liver cancer as an end results of the porphyria The first actual clinical description of the malaise has been attributed to a Dr. Schultz, who was a German graduate medical student in the year 1874. He gave it the name. In some medical journals, they cite Hippocrates as the first to recognize porphyria. However the name is attributed to Schultz. Probably the first clinical description of acute porphyria as a clinical syndrome was made by Dr. B.J. Stokvis in the year 1889. CEP porphyria was identified in the year 1923. In 1930 Hans Fischer, the Nobel laureate, described heme as the compound that makes blood red and grass green. By 1937 Dr. Waldenstrom in Sweden published his findings. For a time AIP was known as Swedish porphyria, or Waldenstrom's porphyria. In the 1960's porphyria research began in earnest in Europe and in the US.The big break came when scientists were able to recognize ALA and PBG in the 60's. So this is a brief overview of the top names in our porph history. Since 1989 the techniques of molecular biology have been used to identify the mutations responsible for porphyria Because this disease was once considered rare and can mimic a host of other more common conditions, its presence is often not suspected. This is a dilemna for both the patient and for their primary care physician. Also sometimes the diagnosis of AIP andother types of porphyria is sometimes made misdiagnosed in patients who do not have porphyria at all. This happens especially if laboratory tests are incorrectly done or misinterpreted. If it is known that someone in a family has porphyria and their enzyme value is indicative of porphyria, other family members who have inherited this deficiency can be identified by measuring their enzyme levels. Latent cases so identified can avoid agents known to cause attacks. However, in some AIP families, PBGD is normal in red blood cells and is deficient only in the liver and other tissues. This is where the tricky area of a confirmed diagnosis is found in my family mutation of this inherited metabolic disease. Falsely low values sometimes occur due to problems with collecting and transporting the sample. Timing is also most important in when tests are administered. 0ften during periods of remission values fall back to the normal level. Tests should if at all possible be started at the very onset of an acute attack. And frustratingly, the tests often have to be repeated more than once. DNA is the material in cells that encodes all the genetic information of an individual. Many different mutations have been identified in the portion of DNA that comprises the gene for PBGD. Almost every family with AIP has a different mutation in this gene. Within one family, however, everyone who inherits a deficiency of PBGD has the same mutation. It is advantageous to know the precise mutation in a family, because that knowledge enables the identification of AIP gene carriers by DNA testing. This approach is much more precise than measuring PBGD enzyme activity in red blood cells. At present, DNA testing for porphyria is available only through a few research laboratories. Below is a list of symptoms many people with Porphyria experience. 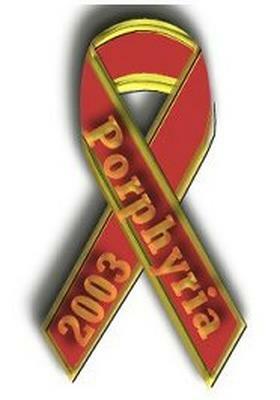 Just because you check off one or two items does not mean you have Porphyria. If you check off many, then you should consult your doctor. Simple tests are available to help determine your Porphyria status. For many, Porphyria remains latent all their life. For some, it becomes acute or even chronic. Of course if you check many of these items, we suggest you order the book and read! Takes notes of all your concerns and make an appointment with your family doctor. He/she may not be familiar with Porphyria. But they can refer you to a doctor IN YOUR AREA where you can RECEIVE help. But if any medical crisis arises, get immediate medical attention. Porphyria is not curable, but certain lifestyle changes and a change in diet and possible medications can make you much more productive and comfortable. Use this checklist Porphyria Symptom Checklist for your own use. It is by no means conclusive, just a starting point. I certainly hope you do not have Porphyria, but if you do, I hope I can help you. 2 Minor Annoyance - occasional strong twinges. 3 Annoying enough to be distracting. 4 Can be ignored if you are really involved in your work, but still distracting. Mild painkillers remove pain for 3-4 hours. 5 Can't be ignored for more than 30 minutes. Mild painkillers ameliorate pain for 3-4 hours. 6 Can't be ignored for any length of time, You can still go to work and participate in social activities. Stronger painkillers (Codeine, narcotics) reduce pain for 3-4 hours. 7 Makes it difficult to concentrate. Interferes with sleep You can still function with effort. Stronger painkillers are only partially effective. 8 Physical activity severely limited. You can read and converse with effort. Nausea and dizziness set in as factors of pain. 9 Unable to speak. Crying out or moaning uncontrollably - near delirium. 10 Pain makes you pass out. Unconscious.